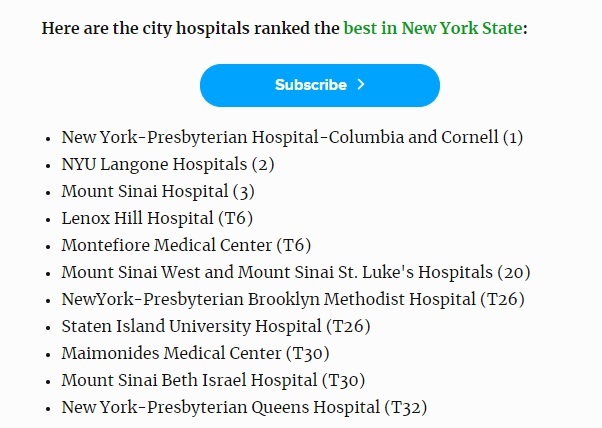 Healthfirst NY Health Insurance 2019 Review. Good? It is right for you? 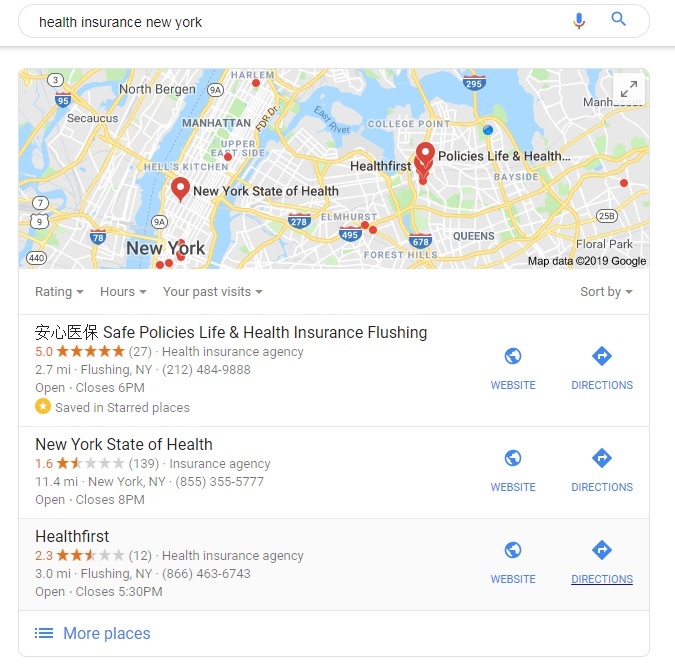 You probably found us on Google by searching "Is HealthFirst good?". However, we are here to answer, rather, is it this company a right fit for you? Headfirst Insurance 2018 complete reviews. Is it right for you? Evaluate Doctors networks, Urgent Care Center, Doctors Networks, Payment links, CSR & many more insider tips. First of all, how are we qualified to provide reviews for you in reference to Healthfirst Insurance? We are one of the brokers that started marketing them from the since the beginning of their commercial insurance launch. We had gotten swamped with people calling us up asking us about, is this insurance company good & we are educating people about, rather how to determine if this insurance company is right for you. Writing a comprehensive article and making a YouTube video covering all these materials is our hope of a more efficient way of doing our job. That way, if you woke up at 2 am in the morning and feel like looking for an answer, hopefully, this page & our yet to be recorded video will serve you well. As I said earlier, we are one of the early adopters to share Healthfirst insurance with our community. Hence, our review may be "Biased". We are a broker that represents most insurance carrier located in NY, from UHC, Empire BCBS, Healthfirst & many other. We got compensated for helping New Yorker & beyond to address their insurance needs. Hence, our royalty is towards our clients. As we can recommend any insurance plan that is suitable for our client, - YOU and no matter which insurance plan you choose, the premium you pay is the same, whether you use us or not. The following is a screen capture from our broker portal. An insurance broker will be compensated around 3-4% of your total insurance premiums. Again, your monthly premiums will be the same regardless if you use a broker or not. HealthFirst First Health or Health First??? Look out for the leaf. Their correct spelling is Healthfirst. 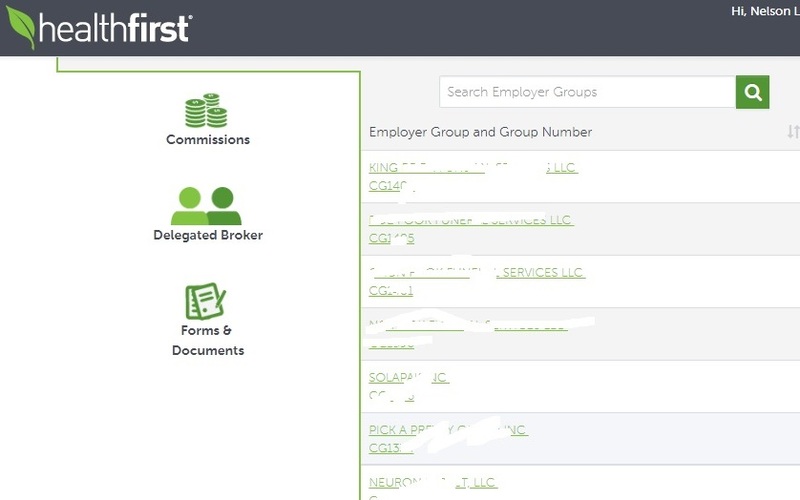 Click below to learn more about First Health Cofinity https://providerlocator.firsthealth.com/home/index Click below to learn more about Health First Healthfirst (the company that we are talking here has a "leaf" in their logo). Hence, the plan they offered is called the Leaf Qualified Health Plans. There are 3 similar companies out there with something like Health First, First Health or something like that. The proper name of this company is actually Healthfirst, without space in between. The background of the company & why it matters to you? 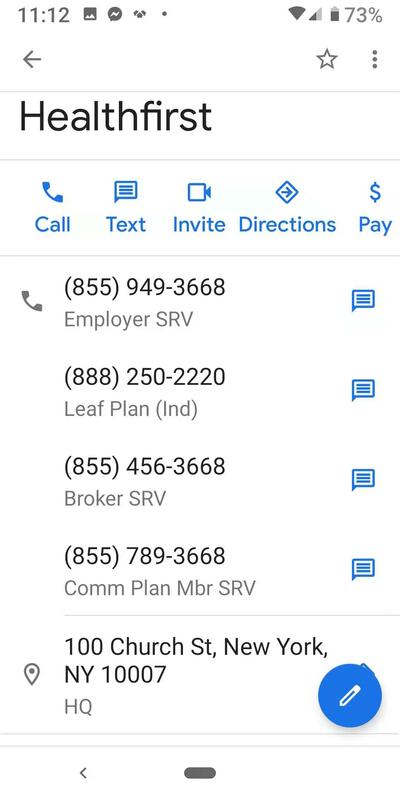 For mosr people, if you just type Healthfirst into a Google search bar, you will see that, the first thing Google suggested is, about their Medicaid plan, as Healthfirst, is originally, a medicaid provider. I am sorry to inform you that, Healthfirst may be a very good Medicaid & Essential plan provider, but, it is not something we have the right to represent, so I can only ask you to click on the link about to find more about the plan yourself. The company has grown about 5 fold in terms of membership count to 1.2 million members in downstate New York since their CEO Pat Wang told the helm from 2008. 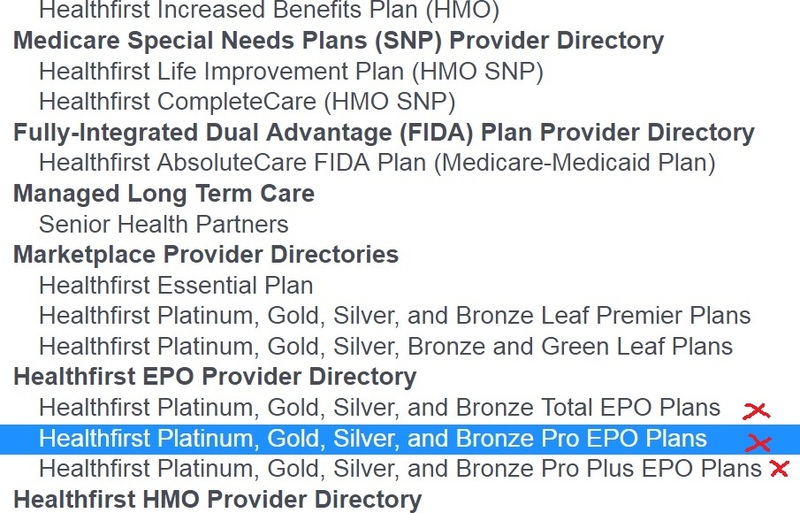 - 2019 Platinum Pro EPO Plan - The Platinum Pro EPO plan has a $0 deductible and low copays. - 2019 Gold Pro EPO Plans - The Gold Pro EPO plans have a $0 deductible and low copays. - 2019 Silver Pro EPO Plans - The Silver Pro EPO plans have a moderate deductible and low copays. - 2019 Bronze Pro EPO Plans (HSA Compatible) - The Bronze Pro EPO plans have a moderate deductible, with low copays and HSA compatibility. Healthfirst network is limited to NY downstate & Nassau County. .i.e. The 5 Boroughs, like Manhattan, Brooklyn, Queens, Bronx & Staten Island plus Nassau County. Healthfirst is well known in offering Medicaid, Child Health Plus, and Managed Long Term Care aka Medicare/Medicaid plans. It is traditionally a strong player in the low-income market. Healthfirst has expanded to Nassau county thru partnering with Greatneck based Northwell Health, or what used to be known as NSLIJ. 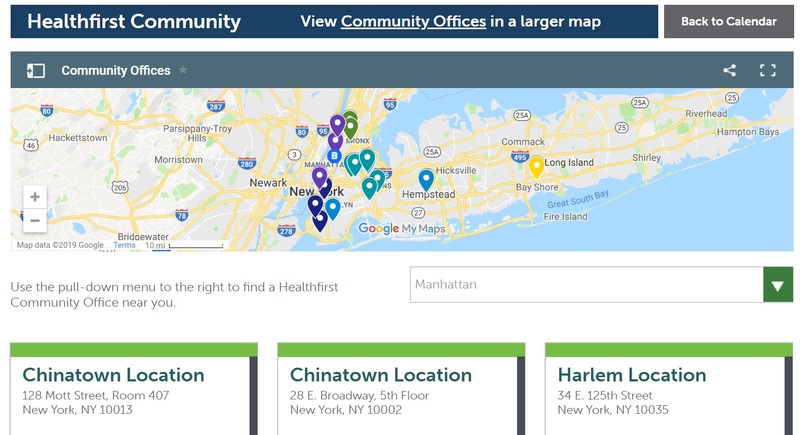 Does the Healthfirst service center location scream immigrants to you? It does. they are traditionally a very strong player in the lower income segment. In fact, there are very well known in the Medicaid & Medicare/Medicaid plans to offer. In fact, being 5 stars in Medicare Healthfirst started from Medicaid managed care & eventually expanded to Medicare and has been getting rave reviews from doctors & even users alike. Since about 2 years ago, there have started also selling full price commercial insurance for groups. Their commercial group plan offering is relatively new. Healthfirst started offering commercial plans starting in 2017. I have met many clients who didn't know about this. 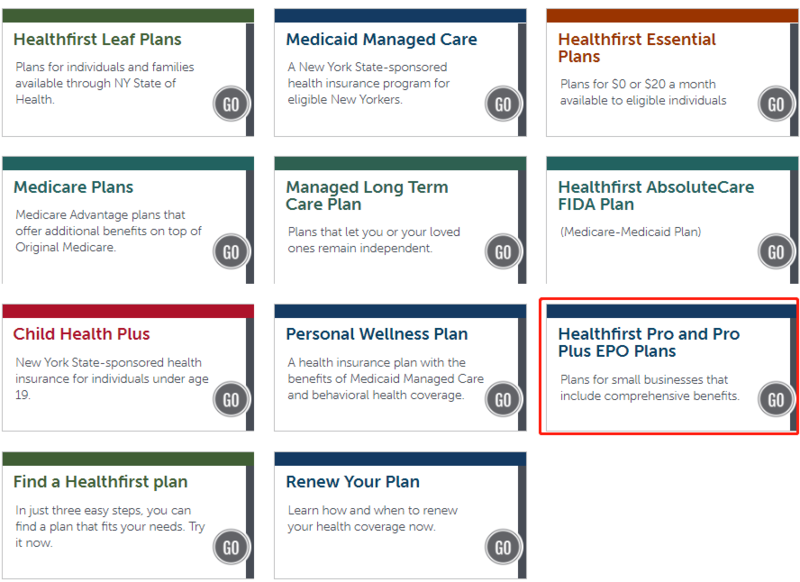 The plans offered are Healthfirst Pro and Pro Plus, Exclusive Provider Organization (EPO) plans for small-business owners and their employees, and Healthfirst Total, an EPO for individuals. 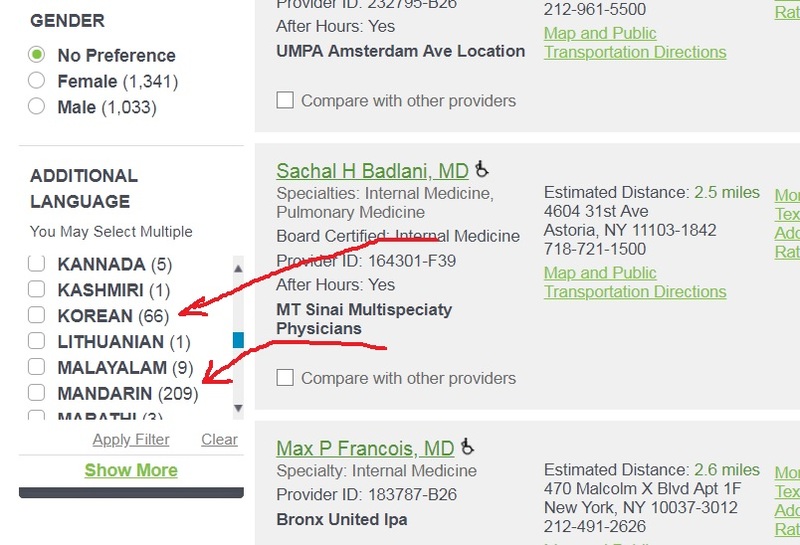 The pro is, if you are an immigrant, Healthfirst is very immigrant friendly with many doctors speaking a second language. Healthfirst Pro. 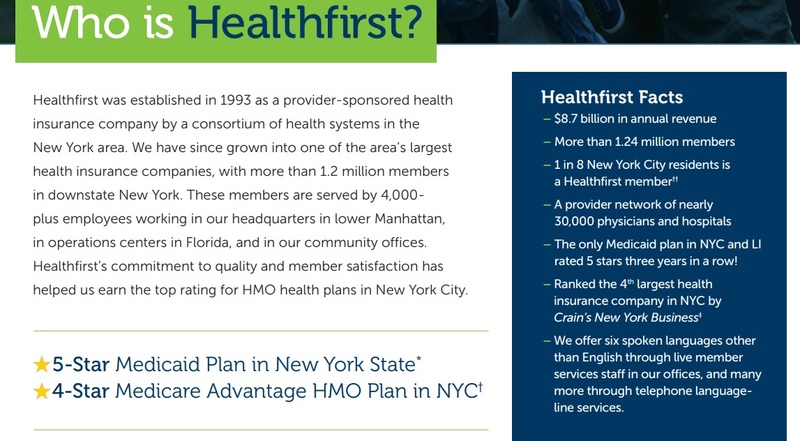 Healthfirst is NY minority population preferred insurance provider? If you don't know, the majority of the NY population is the minority. So Healthfirst is as famous as Metro Plus, which is an insurance company specializing in low-income insurance. As I recalled, we also started selling their commercial insurance 2-3 years ago. After CEO Pat Wang took office (2008-2018, he also an immigrant), the company's business grew five times. 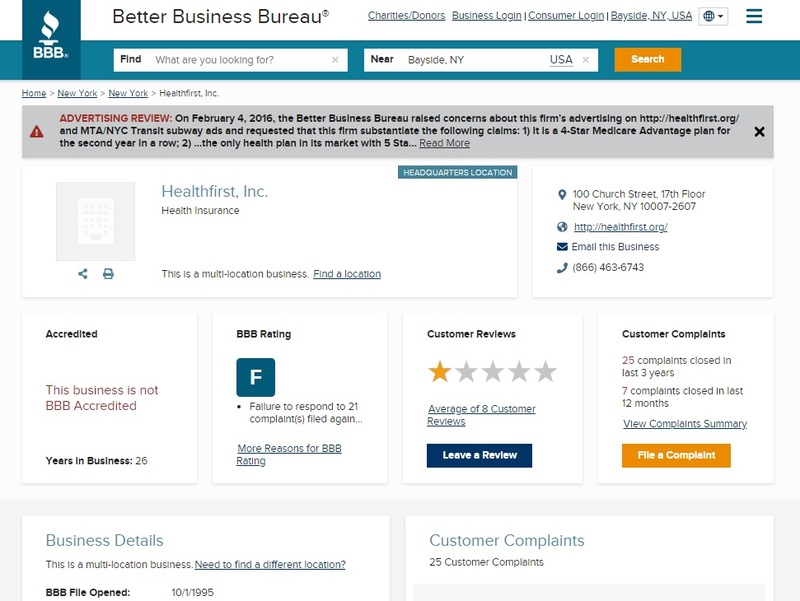 You can see Healthfirst service is getting worse and worse (Five star rate is 1-2 years before). Maybe it is because most of their clients are individual or just walking in or contact them via phone, and the staffs are lack of experience, so they did not give the customer satisfaction service. Healthfirst has a very good relationship with doctors. From what I know, So doctors like this company. But policies often change. So even if the clients convert the insurance company, they still need us. Because we are the bridge between clients and the insurance company. I believe that most of you who read these articles are interested in an individual health plan. Perhaps most people don't know Healthfirst also selling the group health plan. Just like a restaurant, when it is just opened, both the service and the product are good, but after a long time, the quality may be difficult to guarantee. Just like the group plan of Healthfirst. So far it good, but it is hard to say later. And the above comments are all about the individual plan. If you are looking for the prestigious Columbia & Cornell are not in networks. These doctors generally only accept PPO insurance plans from those PPO carriers, like Aetna, Cigna, Empire BCBS & Oxford/UHC. Rating from BBB itself is #BS (click to read why BBB is BS). 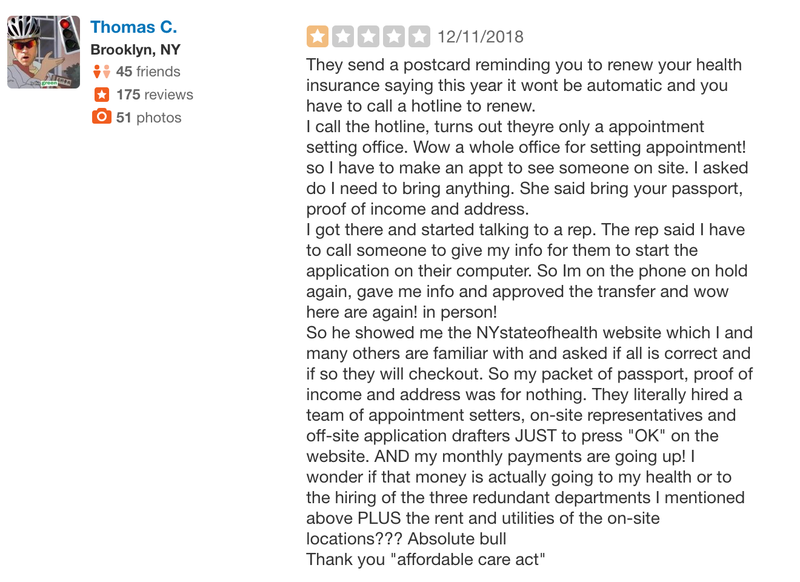 You really need to read the real user reviews, it wasn't good really due to the fact that those are review left from people mostly on their Medicaid, Medicare or Dual Plans. As I mentioned earlier, HealthFirst was traditional Medicaid provider. Hence, it is uncommon for the employee to not treat their clients on Medicaid with full respect, however, that is beyond what I can say. From many of my clients who have been on the plans for about 2 years now, there are very happy with their treatment and reimbursement issue. Yelp reviews also have been around for a good while, hence, many or most of their negative reviews are also from their legacy Medicaid, Medicare & Dual product lines. The 2019 review we are providing here for their Group plan, hence, wait for it, for our final review in the end. Our Client Dr. Yu, one of our Heallthfirst Group plan client told us that one of the employees is missing from the group renew list. I do foresee technical error to plague them for a little while longer. Do bookmark this page so that you will receive the most current updates. Last but not least, Google My Business review. 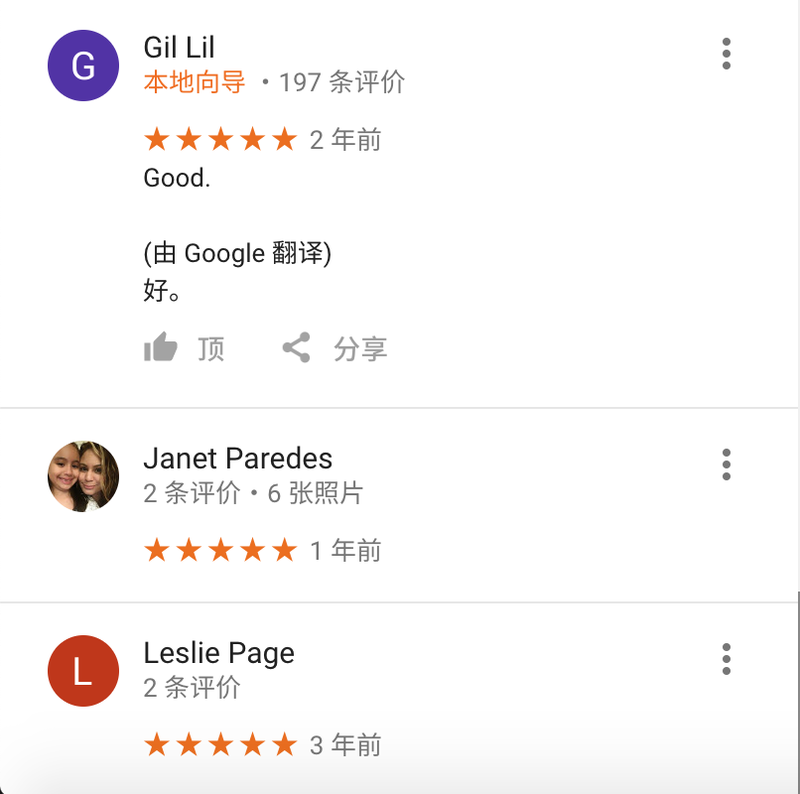 Click below to get an understanding of how Google's doing review services. 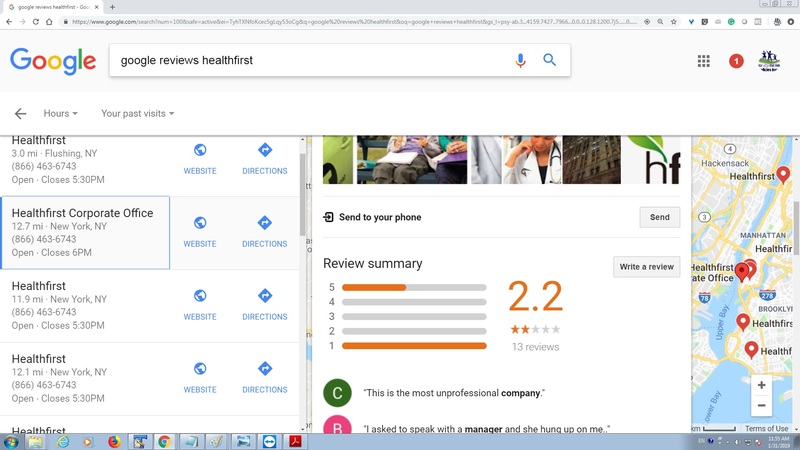 https://www.google.com/search?q=health+first+insurance+reviews+Google+Map&oq=health+first+insurance+reviews+Google+Map&aqs=chrome..69i57.8159j0j7&sourceid=chrome&ie=UTF-8 Google base their review on each local office. Hence, when you click on the link above, you will see there are varying reviews from better to worst. 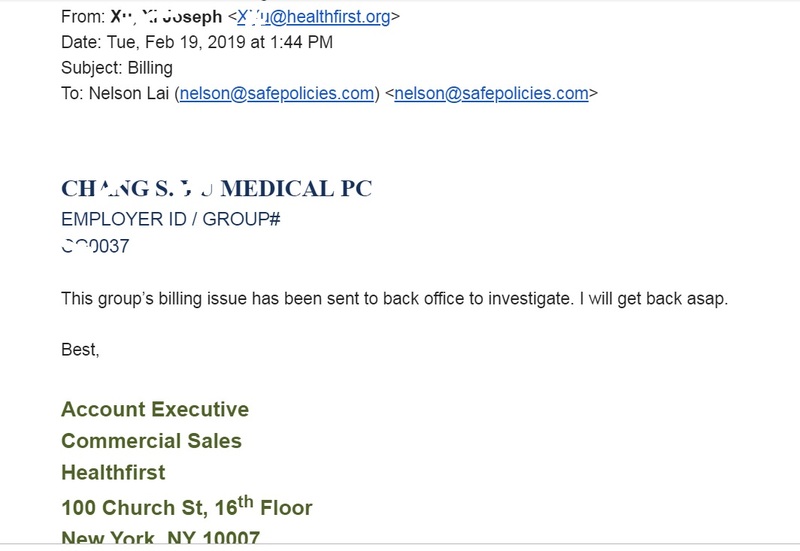 We took the review from Healthfirst Corp Office.